A route planner solution that consists of a mobile application and a Web portal. The solution is intended for building the most optimal automobile route between two points using a diverse range of criteria. These criteria include the day of the week, time of day and hour, current roadworks and closures, ongoing or possible traffic jams and more. 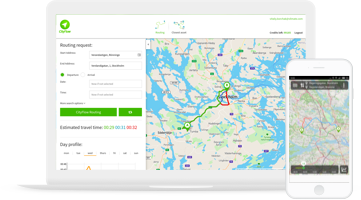 MindConnect is a Swedish provider of innovative smart-mobility and route-planning solutions. Exploiting powers of Mindconnect web-based platforms, transport companies and single users can access real-time data received from connected vehicles and road sensors to improve the quality of customer services, save time, reduce fuel consumption and emissions. MindConnect, our Swedish client engaged in developing and marketing a range of route-planning applications, approached Vilmate with a request to implement a route-planning solution, consisting of a mobile app and a Web portal. The client’s application is used for determining the most optimal automobile route between two points, indicated by the user. In identifying such a route, the application takes into account multiple criteria, which, in particular, include the day of the week, the time of day and hour, any possible roadworks, the existence or possibility of traffic jams and other criteria. Vilmate was engaged to implement the bulk of the project from scratch. To implement the project, Vilmate put together a team of 3 software engineers. From the outset, our team has been managed by the client’s Project Manager. They have also been communicating directly with an in-house back-end developer involved in the project’s implementation. A significant part of the system functionality was delivered by us against a tight deadline associated with the need to integrate the software with a solution developed by one of our client’s partner companies. The integration effort involved direct communication with the software development team of our client’s partners. We delivered and integrated all required functionality on time and in fine quality, thereby efficiently supporting our client’s business development efforts. As a result, the client made a decision to increase our project team by one more developer who is, currently, engaged in implementing the Web-based version of the application. Presently, the project is still ongoing. We have completed the Android version of the application and, currently, Vilmate’s project team is adding new functionality to it’s iOS and Web versions. The client has received a software product that is in full compliance with their requirements, while also being able to cut their development costs by almost a factor of 2. They have been gradually expanding the product’s market, that at the present time, covers not only the whole of Sweden, but also includes such international locations, as Kyiv, Minsk, Moscow and St. Petersburg.